(TibetanReview.net, Nov27, 2018) – The Gonggar Airport, which serves Tibet’s capital Lhasa, had received a record four million passengers so far this year, reported China’s official Xinhua news agency Nov 26, citing the local aviation authorities. Before that, passenger volume at the largest airport in Tibet Autonomous Region (TAR) exceeded two million in 2013, and three million in 2016, the TAR office of the Civil Aviation Administration of China (CAAC) was cited as saying. The report noted that the TAR currently had 10 airlines operating a total of 81 routes, enabling convenient connections between TAR and most of the major cities in the People’s Republic of China. By the end of this year, the Gonggar Airport will have handled a total of 4.3 million passengers, the report added. 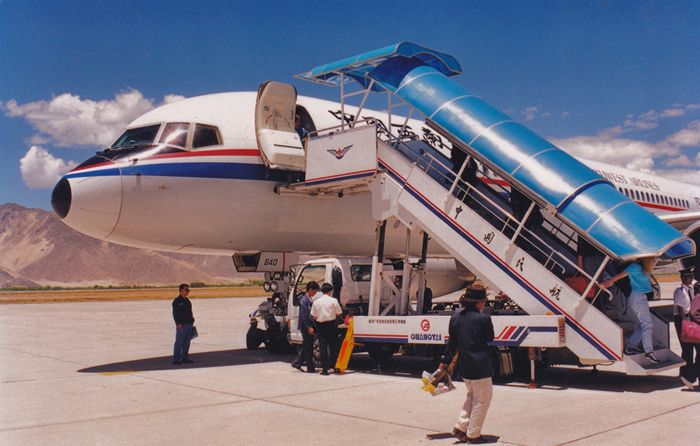 The TAR currently has five civil airports, located in Lhasa, Qamdo (Chamdo), Nyingchi (Nyingtri), Ali (Ngari) and Xigaze (Shigatse). Besides, it is to begin building in 2019 three more airports in Lhunze county of Lhokha city; Dingri County in Shigatse city; and Burang County in Ngari prefecture. And the Gonggar airport will be expanded to add a second runway, according to a Xinhua report Jun 8 and a Chinadaily.com.cn report Jun 12.